Are You Earning Enough Money as a Project Manager? Are Formal Project Sign offs Really Necessary? Are We Bringing Risk to the Projects We Manage? Are You Feeling Buried in Project Work? Chief Project Officer – Should This be a Real Thing? Advancing Your Project Management Career – Is it Time? How did I find my calling to help people make a bigger difference by doing their projects better? What does it take to pass the PMP Exam Based on the PMBOK 6th Edition? What is This Obsession about Project Management All About? Is Earning the PMP Credential an S.M.A.R.T. Goal for You? Find out how to quickly improve your business by improving how you select and do your projects. 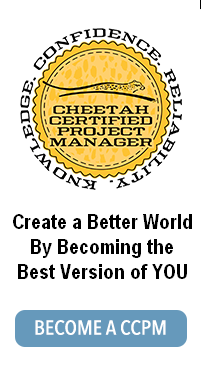 Download Cheetah Learning’s White Paper – Better Projects Better Business. To discuss how to improve your business with project management, contact us! PMI Agile Certification or Scrum – What is the Difference?